Many of Ehrlinger’s family members work in the construction industry. 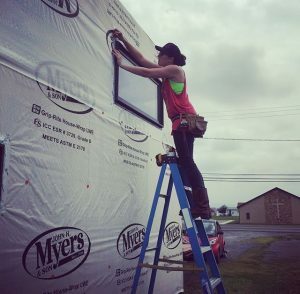 Her father teaches 3D AutoCAD, her mother used to be a general contractor and now does home inspections, and her brother is a contractor who specializes in framing. That foray into tiny house construction fanned a passion in Ehrlinger. She decided to make it her vocation. “I want to help people along each step of the way. I am comfortable traveling to be a DIY consultant. I’ve learned a ton and would like to help others with their THOW projects. I know which resources work for each application,” said Ehrlinger. Erhlinger plans to subsidize her income for the time-being as a real estate agent and landlord. 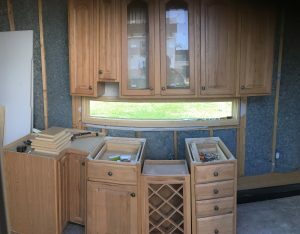 “My boyfriend recently has been doing a lot of work on a boat and I am amazed by how many design elements are applicable to a tiny house build. Some of it is just simple stuff that could be included in a tiny,” said Erhlinger. The house has a modern Murphy bed, minisplit AC, washer dryer combo unit, electric tank water heater, hickory cabinets by Timberlake, and a Jaccuzi jetted tub. “Lofts are difficult for tall people. I’m 5’ 10” and I couldn’t imagine myself in a tiny with a loft. So, I wanted a main-floor bedroom. I like to jump out of bed and stand up straight. The living room converts into a bedroom. I used an Expand Furniture queen-size Murphy bed that folds down over a sofa. The bed is operated by hydraulics, so anyone could raise and lower it,” explained Erhlinger. 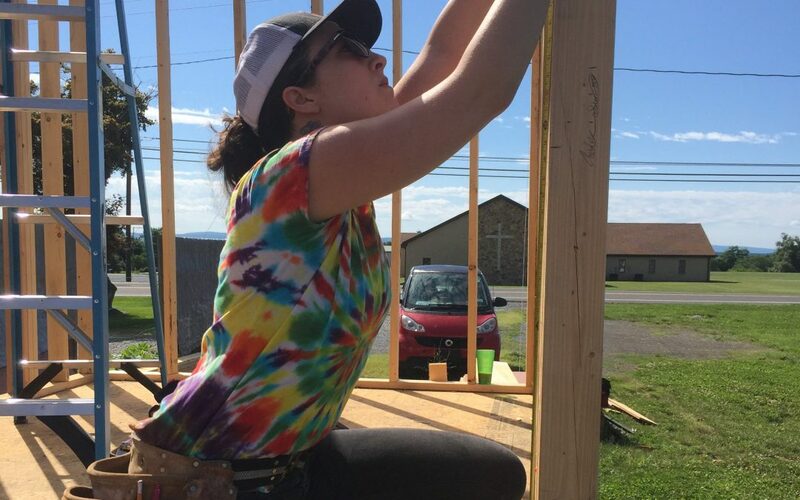 KT has agreed to bring her DIY tiny house to the Mid-Atlantic Tiny House Expo, which will take place at the Howard County (Maryland) Fairgrounds, October 6-7, 2018.